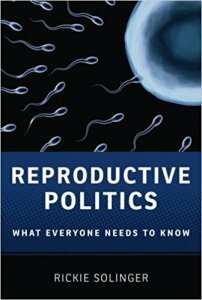 The term “reproductive politics” was coined by feminists in the 1970s to describe contemporary Roe v. Wade-era power struggles over contraception and abortion, adoption and surrogacy, and other satellite issues. Forty years later, questions about reproductive rights are just as complex–and controversial–as they were then. Focusing mainly on the United States, Reproductive Politics: What Everyone Needs to Know explores the legal, political, religious, social, ethical, and medical dimensions of this hotly contested arena. Tracing the historical roots of reproductive politics up through the present, Rickie Solinger considers a range of topics from abortion and contraception to health care reform and assisted reproductive technologies. Solinger tackles some of the most contentious questions up for debate today, including the definition of “fetal personhood,” and the roles poverty and welfare policy play in shaping reproductive rights. The answers she provides are informative, balanced, and sometimes quite surprising.